Summer seems to have settled in for the season. It is time to think about backyard BBQs, swimming and lots of sunshine. We all know how important it is to stay hydrated, but sometimes water needs a bit of a pick-me-up. 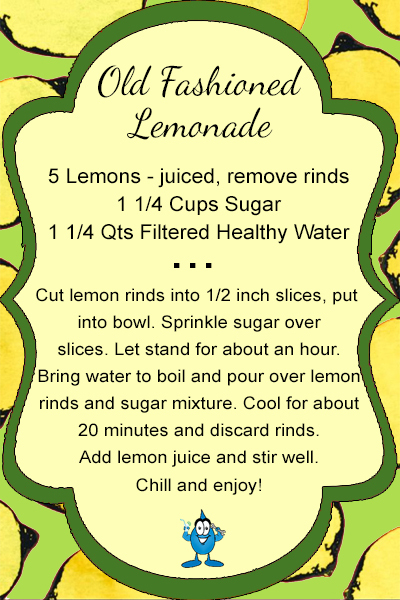 Here is a recipe from my grandmother for the best lemonade you will ever taste. It is perfect in a thermos for baseball games, days at the beach or simply relaxing in a hammock. And remember: all good recipes start with good ingredients. Use fresh, local lemons and always use clean, filtered Healthy Water. Have a great summer!